I’m not usually a “ritual” person. I like change and find routine boring. Except when it comes to making Challah on Friday. I’m not religiously observant by any stretch of the imagination. But there is something that happens when I start my day making dough. It just feels good, and it does set the day apart from the rest of the week. I have come across several good recipes, but this one (posted previously) is my go- to favourite. If it is hard to handle when you are mixing it, just let it sit for 15 – 20 minutes and then go back to it. It will have “relaxed” (hopefully, so will you). This makes 2 HUGE breads, or 3 – 4 normal size loaves. (Pinch ropes together. Number them 1,2,3,4. Put 1 between 2and 3, put 3 where 1 was then take 4 and put it between 3 and 2, and take 2 and put it where 4 was. Continue and tuck the ends under the loaf. If you need to see it, there are you tube videos. Put braided challahs on a cookie sheet with parchment. Cover with damp towel (or do egg wash, but don’t sprinkle with poppy or sesame seeds) and let rise 45 mins – 1.5 hours. Again, it is really forgiving. Just make sure it is puffy and doesn’t spring much when you press it. Preheat oven to 350 degrees. Do the egg wash (maybe for a second time) and sprinkle seeds – sesame or poppy, or my kids’ fave, pasteurized or sparkle sugar. Oh, and you can use the same recipe to make a KILLER bubka. The devil is in…the Brownies. I can deal with an “ok” cookie, as long as it isn’t stale. I love cookies and can’t resist them. But brownies and I have a special relationship. They are my heroin. They DO make bad days better, and good days excellent. That is just the way it is. But there is no room in my life for “ok” brownies. I have noticed that there is a divide – not quite an Obama/Romney divide (don’t get me started), but a gap nonetheless between those who like brownies cakey (gasp), fudgy (my usual) or chewy (sometimes those work too). Heat the oven to 350°F. Butter an 8-inch square pan, line the pan bottom with parchment, and then butter the sides. In a double boiler over simmering water, melt the butter and chocolate (not the chips). Remove the pan from the heat; cool slightly. Stir in the sugar and then the vanilla and salt. The mixture will be somewhat grainy; this is okay. Whisk in the eggs stirring each time until blended. Add the flour and espresso powder, stirring just until thickened and smooth, 30 to 60 seconds. Stir in the extra chocolate chips. Pour into the prepared pan and bake until a toothpick inserted in the middle comes out with moist crumbs (not wet batter) clinging to it, 30 to 35 minutes. I LIKE UNDERBAKING THEM A BIT! Set the pan on a rack until cool. Run a dull knife around the inside edge of the pan and then invert the pan onto a flat surface and peel off the parchment. Flip the baked brownie back onto the rack to cool completely. Cover and place a weight on top. (really – I’m not crazy – this “densifies” them). Refrigerate a few hours or overnight. (These freeze really well. )Cut into squares with a sharp knife. You can double this and bake in a 9 x 13 pan. The verdict: Life is good! A fudgy/chewy kinda great in fact! That ugly looking fleck is a yummy chocolate chip. Mmmm. Cool completely, cover and place a weight on top.Refrigerate a few hours or overnight. 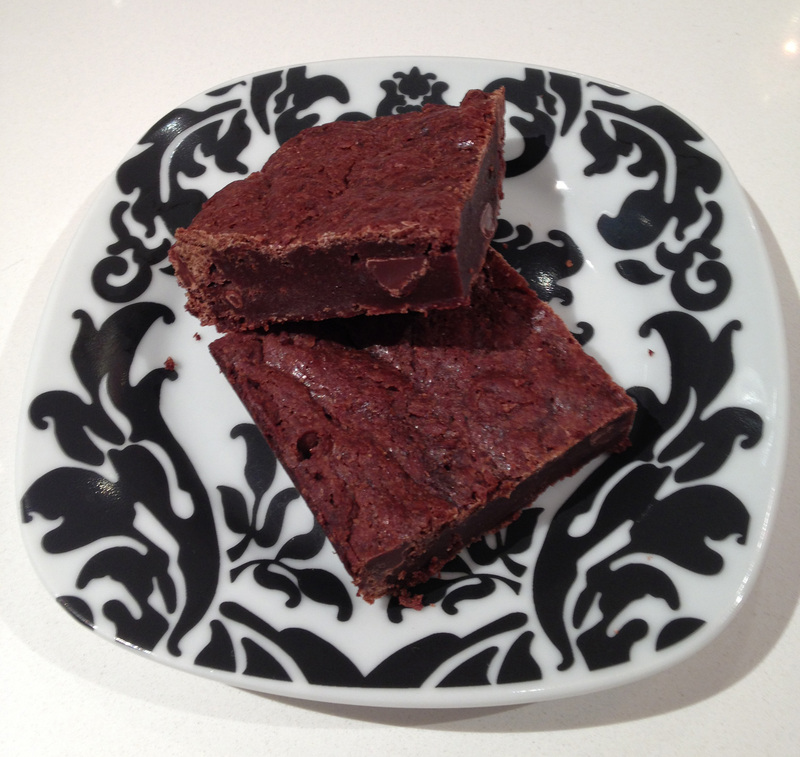 Posted in recipe, Uncategorized and tagged brownie, chocolate on November 7, 2012 by foodicity.